Get all the facts about Croozer’s wide range of accessories. Here, you can find questions and answers about riding with your baby on board. Information and advice about caring for and maintaining your trailer. Everything you need to know about our guarantees and warranties. Check out this section to learn more about hitches and compatibility. Looking for the instructions or manual for your Croozer product? Useful info about jogging and exercising with our bicycle trailers. Find answers to all your questions about our Croozer trailer models. Lots of useful information on parking and storing your bicycle trailer. Info on Croozer replacement parts and the repair of our trailers. Helpful, everyday tips for riding with your bicycle trailer. Important safety guidelines and considerations. Practical information about travelling, excursions and family outings. DOES THE CROOZER SUN COVER BLOCK UV RAYS? The Sun Cover has an ultraviolet protection factor (UPF) of 50+. The plastic windows of all 2018 Kid and Kid Plus models boast a UPF of 80+. Nevertheless, we recommend using sunscreen on the children in the trailer as additional protection from sunburn. CAN I ONLY USE THE CROOZER SKI-ADAPTER KIT FOR CROSS-COUNTRY SKIING, OR DOES IT HAVE OTHER USES? The Croozer Ski-Adapter Kit offers you three new ways to enjoy outings with your children: cross-country skiing, snowshoeing and snow biking! For cross-country skiing, all you have to do is put on the harness system that comes with the kit and attach the ski-adapter feet to your Croozer. Then snap the adapters into a pair of compatible children’s skis, and you’re ready to hit the trails! For snowshoeing, you mount the adapter feet and children’s skis to the sides of the Croozer and the large jogger wheel in front. And for snow biking, you use the two ski adapters and skis in combination with the hitch arm for pulling the Croozer with your fat bike. For safety reasons, the Ski-Adapter Kit is not approved for downhill skiing. The use of the Croozer for downhill skiing would be extremely dangerous for your children. WHAT IS THE BEST WAY TO EQUIP MY BICYCLE TRAILER WITH A LIGHTING SYSTEM? In some countries, child trailers are required to have adequate lighting when used in dark conditions. All 2016 and newer Kid Plus models come with a rechargeable lighting system. It turns on automatically when you are riding in low-light conditions or at night. The 2018 Kid and Dog models come with a battery-powered back light. The handlebars on 2016 and newer Croozer Kid models are pre-equipped for installing the Click & Flash® system, which is also available as an accessory. For older Croozer child trailers from 2009 to 2015, you can purchase a handlebar with an integrated Click & Flash® lighting system as an accessory. For all Croozer models, you can use the battery-powered back light. I OWN AN OLDER CROOZER AND AM HAVING TROUBLE FINDING THE RIGHT ACCESSORIES ON YOUR WEBSITE. ARE ACCESSORIES FOR OLDER MODELS STILL AVAILABLE? Our website lists the entire range of accessories for our latest Croozer models, along with a small selection of items for older models. If you’re looking for any accessories that are not shown here, then ask your local Croozer dealer to assist you. We can help you determine the exact model year of your Croozer in case you are not quite certain. How old does my child have to be to ride in the bicycle trailer? You can transport your child in the Croozer Baby Seat from the age of approx. four weeks. Although there are no generally binding rules on how old your child should be, we recommend following the same guidelines as you would for car seats. If your child is old enough to start riding in an infant car seat, then it’s no problem to begin using the Croozer Baby Seat. However, be sure to take frequent breaks so that your child does not spend too much time in the semi-upright position. Your child can ride in the Croozer Baby Seat until the age of 10 months, or until they are able to sit upright unassisted. After your infant outgrows the Baby Seat, we recommend transitioning to the Croozer Baby Supporter, which is intended for children aged approx. 10 to 20 months. Click here for more information on baby transport. My child can already sit upright unassisted but still needs a little extra support. Does Croozer offer a seat insert for its child trailers? The Baby Supporter is the perfect accessory for children who are able to sit upright unassisted but still need some support. It provides extra stability for your child’s torso and neck. The Baby Supporter is appropriate for children aged approx. 10 to 20 months. For Croozing with your infant, you will need to use a compatible Baby Seat. Our selection guide will help you find the right seat for your Croozer bicycle trailer. Which seat insert fits to my Croozer? Our current Baby Supporter fits to any 2010 or newer Croozer model. However, it cannot be used with older Croozer models or with trailers from other manufacturers. For 2009 and older Croozer models, a different Baby Supporter (Art. 102204103) is available. If you aren’t entirely sure which Croozer model you own, our Model-Year Guide can help! Can I use my Croozer trailer with a standard infant car seat or an infant sling from another manufacturer? Neither standard infant car seats nor infant slings from other manufacturers are compatible with the Croozer. These products do not have the required mounting equipment, and the seats of your Croozer are not appropriate for use with car seats. The Croozer Baby Seat has been specially developed for transporting infants in our trailers. The hammock-like design offers your child a comfortable ride. Its padded side walls and padded 5-point harness hold your child safely and securely in the seat. Can I use two Baby Seats, two Baby Supporters or one of each in my two-seater? Of course! In our two-seaters, you can use any combination of these accessories! Be it one Baby Seat + one Baby Supporter , two Baby Seats or two Baby Supporters: anything is possible, and there’s plenty of space. This is why our Croozer Kid Plus for 2 and Kid for 2 are also perfect for siblings, including twins! Why does the Croozer Baby Seat hold infants in a semi-upright position? Just like in an infant car seat, it is not possible for your baby to lie completely flat in the Croozer. The semi-upright position makes it possible for the harness system to hold your child securely in the seat. This position is ergonomic and provides the necessary support for your infant’s back, neck and head . It is also perfectly fine to take your baby with you on a longer bike tour, as long as you take frequent breaks. HOW OFTEN SHOULD I BRING MY TRAILER TO A DEALER FOR INSPECTION? If you don’t use your Croozer very often, then an annual check-up by your Croozer dealer is sufficient. However, if you are using the trailer more frequently, transporting heavier loads, riding in poor weather and road conditions etc., we recommend having the trailer inspected more than once a year. If your towing bicycle is a pedelec (i.e. with electric assist), some Croozer parts may wear slightly more quickly. In this case, it’s better to have inspection and maintenance work performed several times a year. Your dealer can check that everything is functioning properly and, if necessary, readjust the brakes, lubricate the wheel axles etc. This link will take you directly to our Croozer Dealer Search. WHAT KIND OF ROUTINE MAINTENANCE CAN I DO MYSELF? In the manual that came with your trailer, you will find a section called “Croozer Inspections and Maintenance” with lots of helpful and important information on what types of checks and maintenance work should be done at what intervals. Be sure to perform all required maintenance work at the recommended intervals to ensure that your Croozer will have a long service life. WHAT CAN I DO TO KEEP MY BICYCLE TRAILER LOOKING AND WORKING GREAT FOR AS LONG AS POSSIBLE? The fabric body, the seat and all metal parts can be cleaned with water, a soap solution or a mild household detergent. Ideally, use biodegradable cleaning agents to minimise environmental impact. A soft brush can be used for cleaning areas of heavy soiling. Never use thinners, solvents, mineral spirits or other aggressive chemicals, as these could damage the materials. To protect metal parts from corrosion, a thin coat of paste wax should be applied. Preserving metal parts with paste wax is especially important if you plan to use the Croozer often in wet weather, in the winter or in salty air near the sea. Never use pressure washers. The strong water pressure could damage the fabric and plastic windows or force water into the wheel bearings, shortening their service life. After cleaning your Croozer, you should give it plenty of time to dry before using it again. IS THE FABRIC BODY OF MY BICYCLE TRAILER WASHABLE? Theoretically, it’s possible to wash the fabric body of your bicycle trailer. However, it should never be machine washed – even on your machine’s gentle cycle. Cloudy patches could form in the plastic windows, and the fabric could shrink, meaning it would no longer fit to the frame. Therefore, the fabric body should only be washed by hand using a mild soap solution. Ideally, have your Croozer dealer help you remove and reattach the body. Attaching the fabric body is a fairly complicated procedure – and because the body is part of the Croozer’s safe passenger compartment, it is of utmost importance that everything is properly mounted. HOW DO I PREVENT THE GROWTH OF MOULD AND MILDEW? Before parking or storing your bicycle trailer for longer periods, always make sure it’s clean and dry. Otherwise, mould or mildew could develop. The Croozer Storage Cover (available as an accessory) is perfectly suited for protecting your Croozer, e.g. overnight, from rain and dirt. However, it is not breathable. Therefore, only use the Storage Cover for longer periods if your trailer is clean and dry. Keep in mind: the fabric of the Croozer body is not, in itself, a suitable medium for the growth of mould and mildew. Moulds feed off organic matter in the fabric, e.g. food residues, dirt etc., and grow best in warm, damp and humid conditions. If you do happen to find a small amount of mould or mildew on your Croozer, it can be cleaned using a mild alcohol-based cleaning agent, 5% household vinegar or a 5% sodium bicarbonate solution from the pharmacy. Never use harsh chemical fungicides. Most of these chemicals are highly toxic and dangerous to your child’s health. For severe cases of mould or mildew, all affected parts would have to be replaced. In such cases, contact your local Croozer dealer for assistance. I ALSO USE MY BICYCLE TRAILER IN THE WINTER. ARE THERE ANY SPECIAL WINTER CARE TIPS? A Croozer can be a reliable companion all year round, even during the colder months of winter. After using your Croozer in rainy or snowy conditions, we recommend drying it thoroughly with a clean cotton cloth. In order to prevent the growth of mould or mildew on fabric parts, make sure the trailer is completely dry before storing it for longer periods. Road salt can have damaging effects on the materials of your trailer over time. Therefore, we recommend periodically applying paste wax to all metal parts! You can usually remove rust spots using metal polish and a sponge . Subsequently, apply a thin coating of paste wax, and the metal surfaces will be ideally protected in any weather. 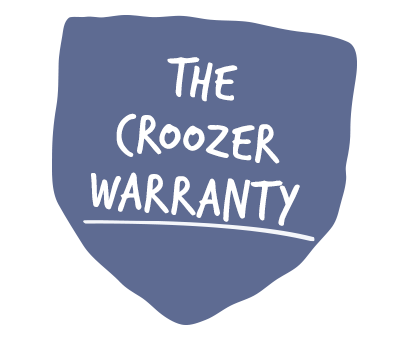 What types of warranties does Croozer offer? Your Croozer frame comes with a 10-year warranty. All other parts of your Croozer bicycle trailer manufactured in 2018 or later are covered by a three-year warranty from the date of purchase. Our Warranty page provides more information, as well as a link for downloading the terms and conditions of our “Warranty for Croozer Trailers ”. The universal hitch that came with my Croozer does not fit to my bicycle. What can I do? Be it e-bike, mountain bike or roadster – every bicycle is different! If the hitch that came with your Croozer cannot be safely mounted to your bicycle, you can choose from a large selection of alternative hitches. If you own a 2016 or newer Croozer Kid or Kid Plus model, any Croozer trailer 2018 or newer, or a Croozer Dog with Click & Crooz® system, then our Hitch Finder can most likely help you find the right solution! If you own a Croozer Dog without Click & Crooz®, a Cargo, a Mini or an older Croozer child trailer model, then you can use one of our adapters. These are available in thru-axle, axle-nut and quick-release versions. Your Croozer dealer can offer guidance and order the right adapter for you. We can help you determine the exact model year of your Croozer! Can I use a Click & Crooz® hitch with an older Croozer model that isn’t equipped with Click & Crooz® fasteners? The current Click & Crooz® hitch was developed for all Croozer models 2018 and for 2016 and newer Croozer Kid and Kid Plus models. It cannot be used with Croozer models from previous years. The universal hitch doesn’t fit to your bike? No problem! We have a solution for you! Check out our Hitch Finder for more information and guidance. If you would like to use a Click & Crooz Hitch with an older Croozer model, you can order a Click & Crooz hitch arm for retrofitting to your trailer. Then it’s possible to use the Click & Crooz® axle nut, quick-release or thru axle for your bicycle. Check out our Hitch Finder for more information and guidance. For help with ordering and retrofitting a Click & Crooz® hitch arm, please contact an authorised Croozer dealer in your area. Where can I find the manual for my Croozer product? If you’re looking for the manual or instructions for your Croozer trailer or accessory, then you can find it quickly on our website. If you have any more questions, we recommend contacting a local Croozer dealer! Can I use my Croozer for jogging? You may have asked yourself why your Croozer manual refers to walking instead of jogging. In fact, it is perfectly safe to use your Croozer for jogging. There is a reason why we nevertheless use the term “walking” in our manuals. Once a year, we have our Croozer Kid and Croozer Kid Plus tested for harmful substances by TÜV Rheinland. In order to qualify for this testing, we are required to submit proof of general product safety from a GS certification body. According to this certification body, a stroller can only be used for jogging if it is equipped with a hand-operated control brake. Although our child trailers have an extremely safe, enclosed passenger compartment designed for maximum protection in road traffic, they are nevertheless categorised as “open strollers” in the context of testing services for harmful substances, and in some open strollers, the child passenger could be injured if the stroller were to tip over. Because our child trailers are not equipped with the necessary control brake, TÜV requires that our user manuals warn against using them for jogging. Unfortunately, we have not been able to convince TÜV to reconsider this restriction, which in our opinion is neither logically nor legally justifiable. Therefore, we have no choice but to continue sharing this information in our user manuals for as long as we have our products tested for harmful substances by TÜV. Can I use my Croozer for inline skating? There are several reasons why Croozer child trailers are not intended for inline skating. Not only can you reach much higher speeds on inline skates, but also our child trailers are not equipped with a hand-operated control brake. This means it would be much more difficult to stop or slow down, e.g. in potentially dangerous situations. For example, in order to stop while inline skating with your Croozer, you would have to counter the momentum of your own weight plus that of the trailer. This is why we strongly advise against using the Croozer for inline skating. When I’m jogging with the Croozer, the jogger wheel sometimes pulls to the left/right. How can I correct this issue? Do you have a Croozer with a Click & Crooz® fastening system (model year 2016 or newer)? If so, you can easily adjust the alignment of the front wheel by turning the rotary knobs at the front ends of the two jogger-wheel arms. Or do you own an older Croozer model? If so, the wheel alignment is still very easy to adjust: simply open the quick-release of the jogger wheel and reposition the wheel in the dropouts. Close the quick-release again to secure the wheel, and you’re all set! When closing the quick-release, make sure the wheel axle is secured at a safe distance from the opening of the dropouts to prevent it from slipping out while in use. How are the current Croozer models different from those of previous years? For the 2018 model year, we have completely redesigned all of our bicycle trailers. The silhouette is sportier and more modern. The new fabrics and colours are even more eye-catching! In addition, we are offering a 3-year warranty for all 2018 bicycle trailers, and a 10-year warranty for their safety frame. Click here to learn more about our warranty conditions. For our Croozer Kid and Croozer Kid Plus child trailers, we focused on even more practical and user-friendly features. For example, the 5-point harness system can now be adjusted in seconds – regardless of whether your child is wearing light summer clothes or a puffy snow suit. And locking up the Croozer is easier than ever: thanks to the new bumper design, all you need is a standard bike lock to secure it to the nearest lamppost or bike rack. As of 2018, all plastic windows on our child trailers offer an ultraviolet-protection factor (UPF) of 80+! The Kid Plus still comes equipped with our patented Croozer AirPad® suspension and a sensor-activated lighting system built into the handlebar. And the Croozer Kid now comes with a battery-powered tail light. Our new pet trailer, the Croozer Dog XL, is the first bike trailer specially designed for carrying very large dogs. We consulted with veterinarians and dog experts to ensure that the new design would meet the needs of your hefty four-legged friend. The bottom edge of the door is extra-low to make it easy for older and disabled dogs to enter and exit. Large mesh windows provide ample ventilation. Thanks to the special design of the new bumper, it can be easily locked to the nearest stationary object (e.g. lamppost) using a normal bike lock. The information provided here can help you determine whether the Dog XL is the right trailer for your pet! The new Croozer Cargo trailer comes with an attractive, zip-on cover. A super-practical Handcart Kit is available as an accessory. The two side guards not only protect the wheels but can also be used as carrying handles or attachment sites for a bike lock. The sturdy cross frame ensures optimal load distribution. WHAT’S THE DIFFERENCE BETWEEN THE CROOZER KID AND CROOZER KID PLUS? The Kid Plus child trailer comes equipped with Croozer AirPad® suspension. This system smoothes out the ride, absorbs bumps and offers young passengers unparalleled comfort! And the best part: the AirPad® never needs adjustment. It adapts automatically to the weight of your children and the load in the cargo compartment. Click here to learn more about Croozer AirPad® suspension! The Croozer Kid Plus also comes with a Click & Flash® sensor-activated lighting system for night-time visibility . These built-in handlebar lights switch on automatically when it gets dark if the Croozer is in motion. The powerful battery can be easily charged via USB and offers 15 hours of light per full charge! The Croozer Kid Plus is available as a one-seater or two-seater, both in the colour Ocean blue. The Croozer Kid, without suspension, also comes in one-seater and two-seater versions, and its colour is Lemon green . HOW DOES THE CROOZER AIRPAD® SUSPENSION SYSTEM WORK? Click here to learn more about our innovative suspension system! The video offers a brief and easy-to-understand overview, and the texts and diagrams provide more detailed information for techies. WHERE CAN I FIND THE SERIAL NUMBER ON MY BICYCLE TRAILER? On all 2018 Croozer Kid and Kid Plus models, the serial number can be found inside the rear cargo compartment in the middle of the rear section of the base frame. The number is engraved on a small plate. The easiest way to read it is to hold your smartphone inside the cargo compartment and take a flash photo. Otherwise, if you fold the Croozer and pull back the 2-in-1 cover, you’ll be able to see the small plate with the serial number right beside the edge of the seatback . On all Kid and Kid Plus models from 2006 to 2016, you can find the serial number on a white sticker inside the cargo compartment of the trailer. This sticker is attached inside the left section of the black base frame. On older Croozer models (up to 2005), the serial number can be found on the front section of the frame inside the foot area. On all 2017 and older Croozer Dog models, the sticker with the serial number is attached to the left section of the frame inside the passenger compartment. On the older model, you can find it on the bottom surface of the hitch-arm attachment bracket . On 2017 and older Croozer Cargo models, the serial number can be found on the left rear section of the frame. On the older model, the sticker is attached to the bottom of the left section of the frame near the hitch-arm attachment bracket. HOW CAN I FIGURE OUT WHICH CROOZER MODEL I OWN? The Croozer has been around since as early as 2003, and our models have undergone many changes over the years. If you aren’t entirely sure which Croozer model you own, our Model-Year Guide can help! I DON’T HAVE A LOT OF SPACE AT HOME. IS IT POSSIBLE TO MAKE MY CROOZER MORE COMPACT FOR STORAGE? Your Croozer can be folded to a compact size in a few quick steps. Detachable parts (e.g. the wheels, handlebar and hitch arm) can be easily stored inside the Croozer. When folded in this way, the Croozer is easy to store in a cellar or hallway. On the respective product pages, you can find the folded dimensions of each Croozer model! HOW AND WHERE SHOULD I PARK MY TRAILER WHEN IT’S NOT IN USE? The best and safest place to park your Croozer is in a locked room or garage . However, we know that this isn’t always possible. If you have to park your Croozer outside, it’s best to secure it by stringing a long, high-quality cable lock through the frame and wheels and locking it to a stationary object . A Storage Cover is also available for protecting the Croozer from dust and dirt. Keep in mind: the Storage Cover is not breathable. Therefore, it should not be used for long periods of storage unless your Croozer is completely dry. Otherwise, you may have to deal with unattractive mildew stains or even potentially harmful moulds. I’D LIKE TO STORE MY BICYCLE TRAILER OVER THE WINTER. IS THERE ANYTHING I NEED TO CONSIDER? Be sure to clean your Croozer thoroughly before storing it for a longer period of time. You can find more information in the section on CARE & MAINTENANCE. After cleaning your trailer, allow it to dry completely, and use paste wax to protect metal parts. The best place for storage is a dry, dust-free and well-ventilated room. You can use the Croozer Storage Cover (available as an accessory) to protect it from dust and dirt. Ideally, place a moisture-absorbing packet inside the trailer to prevent mould, mildew and corrosion. Otherwise, be sure to remove the Storage Cover periodically to allow the trailer to air out. Can I have the fabric exterior and seat of my bicycle trailer replaced? Is your Croozer is getting older? Does the fabric body have a few tears, or is it simply not as attractive as it used to be? Has the seat seen better days? Then you can easily have the body and/or seat replaced. This procedure can be a bit tricky and time-consuming, which is why we recommend having it done by a local Croozer dealer. Be sure to give the dealer the correct model year so that they can order the appropriate parts. If the fabric body or seat has tears that are too large to fix, then these parts should be replaced for safety reasons. Your dealer can help you assess the damage. I’d like to return a product. What’s the process for returns? If you would like to return something, then contact the dealer or online shop where you purchased your Croozer product. Have you since moved and therefore can’t make it back to the original dealer? No problem. Simply look for a new Croozer dealer in your area. They will also be able to provide advice and assistance! In any case, be sure to bring the original sales receipt. I would like to have something repaired. Where can I find a Croozer dealer in my region? You can use our Dealer Search to locate the Croozer dealer nearest you. There are approximately 1,600 sales outlets in Germany alone, and many more worldwide. It should be easy to find one nearby! Where can I find replacement parts for my Croozer? All replacement parts – from nuts and bolts to a brand-new fabric body – can be ordered from your local Croozer dealer. Be sure to tell the dealer your Croozer’s model year so that they can order the appropriate parts. If there’s a small hole in the side window or fabric body of my Croozer, can I fix it myself? If the tear is large or near a seam, then we recommend contacting a local local Croozer dealer – just to be on the safe side! Small holes or tears in the side windows can usually be repaired using a waterproof, transparent patch: e.g. a repair patch (2 x 2 cm) can be ordered from your local Croozer dealer. If there’s a small tear or hole in the fabric body, you can order a repair pad in the colour of your trailer from your local Croozer dealer. The pad should ideally be attached using a permanently elastic adhesive (e.g. from the company Pattex). IS THERE ANYTHING I SHOULD CHECK BEFORE EACH RIDE? ✔ Is the hitch arm correctly mounted (to the left side)? ✔ Is the mesh window – or in poor weather conditions, the entire 2-in-1 cover – rolled down to protect passengers from insects, road debris and moisture? WHAT REQUIREMENTS DOES MY BICYCLE HAVE TO MEET IN ORDER TO PULL A TRAILER? In general, the trailer can be pulled using any bicycle with a 26” to 29” rear wheel . However, some restrictions apply to the use of e-bikes: electric bicycles with a maximum speed of more than 25 km/h (15 mph) are officially classified as mopeds in some countries and, as such, are often not allowed to pull bicycle trailers. See next question for more information. AM I ALLOWED TO PULL MY BICYCLE TRAILER USING AN E-BIKE/PEDELEC? Yes, you are also allowed to pull your Croozer using a bike with electric assist (a “pedelec”). However, we strongly advise you to take your e-bike and trailer to a local Croozer dealer, who can make sure the hitch is mounted safely and correctly to the rear axle. Many pedelecs have special rear wheel hubs. A professional bicycle mechanic can offer the necessary expertise. In addition, we recommend keeping an eye on your speed and not riding too fast. Although the Croozer itself is able to handle higher speeds, your young passengers will be much safer if you ride more slowly. At higher speeds, it is much more difficult to keep the bicycle and trailer under control, and the risk of accidents increases. Keep in mind: in some countries (e.g. Germany ), more powerful pedelecs (S-Pedelecs) and throttle-operated e-bikes that can travel at speeds above 25 km/h (15 mph) are not allowed to pull a bicycle trailer. Accordingly, no other type of motorised vehicle, like a moped or scooter, can be used for towing a trailer. Every country has different laws, so be sure to familiarise yourself with the laws that apply in your region before using the trailer with any kind of motorised vehicle. IN TWO-SEATERS, DOES IT MATTER WHO SITS WHERE? Regardless of whether both of your children are about the same size or one is much older than the other, you can transport both in a two-seater without having to ensure that the weight is evenly distributed. Even if only one of your children is on board, your child trailer will always offer stable road-holding. Thanks to its low centre of gravity and wide wheelbase, your Croozer is exceptionally stable and resistant to tipping. For optimal protection in dangerous situations – e.g. if you should happen to ride over an unseen obstacle with one wheel at high speed and your Croozer is propelled upwards on one side – we recommend the following: if only one child is riding in a two-seater, then the passenger should ideally sit on the right side (relative to the direction of travel), and if you are transporting two children in the Croozer then the lighter child should sit on the left side. However, if you are carrying an infant in a Baby Seat on the left side and an older child on the right and need to drop off your older child, e.g. at nursery school, and continue riding with your infant, it is not necessary to move the Baby Seat to the right side while your infant is riding alone in the passenger compartment. WHO’S ALLOWED TO RIDE THE TOWING BICYCLE? In Germany you have to be at least 16 years of age in order to ride a towing bicycle with a child trailer. This age restriction does not apply to pet and cargo trailers, which can be pulled by riders of any age. Be sure to familiarise yourself with the relevant laws in your region before using the Croozer as a child trailer. IS THE USE OF THE ORANGE SAFETY FLAG MANDATORY? When pulling a trailer in road traffic, the use of the safety flag is mandatory. The eye-catching flag makes it easier for other road-users to see the trailer. DOES MY CHILD HAVE TO WEAR A HELMET IN THE BICYCLE TRAILER? Some countries have mandatory cycle helmet laws. Be sure to familiarise yourself with the laws in your region before using the child trailer. In countries like Germany, where the use of bicycle helmets is not mandatory, children in bicycle trailers are also not required to wear a helmet. 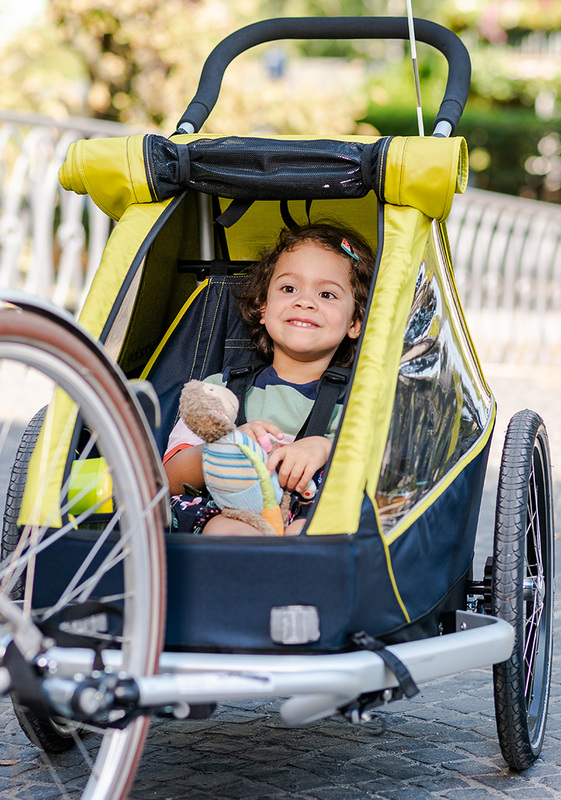 The Croozer frame design, with roll-over and side-impact protection, provides a well-protected space for your children so that you can travel together safely. Nevertheless, we think it makes sense to help children get used to wearing a bicycle helmet as early as possible. Special helmets with flat backs are available for use with bike seats and trailers. These helmets make it possible for children to rest their heads comfortably on the seat back. One example is the model “Rookie” from the company Abus. Infants in the Croozer Baby Seat cannot wear a helmet because there are no helmets suitable for this semi-upright position. As soon as your children are old enough to sit in the Croozer seat (with or without the Croozer Baby Supporter), they can start wearing a helmet. If you’re planning to visit a different country with your Croozer, be sure to familiarise yourself with the laws that apply to helmet use in child trailers. HOW SAFE ARE BICYCLE TRAILERS? Our child trailers comply with all international standards for bicycle trailers and strollers. As a result, you can rest assured that your Croozer is a completely safe product that satisfies all relevant testing criteria. The Croozer’s safe passenger compartment protects your child from all sides. More information can be found in our safety section. DOES THE CHILD TRAILER PROTECT PASSENGERS FROM UV RAYS? The side windows as well as the integrated rain cover of the 2018 Kid and Kid Plus models have an ultraviolet protection factor (UPF) of 80+. The fabric body, with its weave density and coating, has an UPF of 50+. On particularly bright and sunny days, we recommend using the Croozer Sun Cover, which is available as an accessory. It is made from the same fabric as the trailer and therefore also offers a UPF of 50+. Nevertheless, we recommend using sunscreen on the children in the trailer as additional protection from sunburn. DO I NEED LIGHTS ON MY BICYCLE TRAILER WHEN RIDING AT NIGHT? HOW CAN I PROTECT MY BICYCLE TRAILER FROM THEFT? We’re happy that our bicycle trailers are so popular, but unfortunately, they’re also highly sought after by thieves. Therefore, we recommend taking adequate measures to protect your Croozer from theft wherever you leave it. At home, it’s best to keep it in a locked room or garage. All 2018 Croozer models are equipped with a bumper or side guard that can be used for the attachment of a standard bike lock, e.g. for securing your trailer to the nearest lamppost or bike rack . On older models, we recommend threading a long loop cable through both side wheels and the frame and locking it to a stationary object. For additional safety, the hitch arm on all Croozer models with a Click & Crooz® fastening system has a locking system for securing the trailer to the bike. This lock comes with three keys. It is not possible to order additional keys, so be sure to keep them in a safe place. If you need more keys, you can have new copies made by a locksmith or other key-cutting service. The hitch-arm lock is only intended for short-term theft protection: e.g. for when you stop at the bakery and leave your bicycle and trailer parked right outside in plain view, or if you ride to the supermarket and want to leave the hitch arm locked to the bike while you take your Croozer shopping with you in stroller or jogger mode. We recommend asking your insurance provider whether your policy (e.g. household-contents insurance or bike insurance) covers the theft of bicycle trailers. If not, it’s often possible to purchase extended coverage for bicycle trailers locked to fixed objects (i.e. outside of a locked room). I’D LIKE TO TAKE MY BICYCLE TRAILER WITH ME ON HOLIDAY. IS THERE ANYTHING I NEED TO CONSIDER? If you’re planning to use your Croozer in a different country, be sure to check whether there are special laws that apply to the use of bicycle trailers in the regions you will be visiting. In some countries, the use of a bicycle helmet is mandatory, even for young passengers in bicycle trailers. CAN I TAKE MY CROOZER TO THE BEACH? Your Croozer is also an ideal companion for holidays at the beach! While strollers with small wheels tend to get stuck in the sand, your Croozer with its large jogger wheel can make it effortlessly all the way to the water’s edge. To protect your trailer from the damage and corrosion caused by salty air, be sure to apply a thin coating of paste wax to all metal parts before your trip. CAN I TAKE MY BICYCLE TRAILER ON AN AEROPLANE? Theoretically, it should not be a problem to take your bicycle trailer with you on an aeroplane. Some airlines will even transport it free of charge as a stroller. However, there are also airlines who will only transport trailers as specialty items or sports equipment in an appropriate box or bag. This is why we recommend saving the original packaging materials: in cases like these, you would have the perfect-size transport box for your trailer. It’s always a good idea to contact the airline prior to your trip in order to discuss all applicable rules and considerations. DURING THE SUMMER MONTHS, HOW CAN I PREVENT MY CHILDREN FROM GETTING TOO WARM IN THE CROOZER? We recommend keeping the front rain cover rolled up and the mesh cover down when using the Croozer on hot and sunny summer days. The screen in front protects your passengers from debris and insects while letting plenty of fresh air into the passenger compartment. If your child nevertheless feels too warm, then you can also leave the rear cargo-compartment cover open while riding. This allows for additional ventilation from behind without creating an uncomfortable draught. IN THE WINTER, HOW CAN I PREVENT MY CHILDREN FROM GETTING TOO COLD IN THE CROOZER? Ideally, your children should be bundled up in warm clothing when riding in the trailer during colder winter months. For our latest Croozer Baby Seat model, a special Winter Kit is available. It consists of a fleece-lined Winter Bunting Bag in the colour of the Baby Seat and a fleece seat cover. It attaches easily to the Baby Seat with a zipper and cradles your infant in a warm cocoon. HOW CAN I FOLD AND TRANSPORT MY BICYCLE TRAILER? Would you like to transport your Croozer in a car? Or are you planning on taking it with you on a train trip? No problem! A few quick steps is all it takes to fold your Croozer to a manageable size for transport. Detachable parts, such as the wheels, handlebar and hitch arm, can be easily stored inside the Croozer. When folded, the Croozer is easy to carry and small enough to pack away in your cellar, your hallway or the boot of your car. On the respective product pages, you can find the folded dimensions of each Croozer model. HOW CAN I TAKE MY CHILD TRAILER UP AND DOWN STAIRS? The Croozer’s handlebar is not made for pulling it up stairs or pushing it down stairs. In these cases, you should ask someone to help you carry it, use a lift or fold the Croozer to a more manageable carrying size. WHAT IS THE MINIMUM AND MAXIMUM AGE FOR PASSENGERS IN THE BICYCLE TRAILER? Children can ride in the Croozer from as early as infancy. The specially designed Croozer Baby Seat is as comfortable as a hammock and as safe as a car seat. For more information, see our section on baby transport. Children can ride in a Croozer child trailer until they are 6 years old or have reached a height of 117 cm (46 inches). This means that you can enjoy many long years of Croozing with your children in tow, and the trailer is also perfect for siblings! ARE THE MATERIALS USED IN CROOZER CHILD TRAILERS TESTED FOR HARMFUL SUBSTANCES? Yes, all materials used for the Croozer Kid and Kid Plus are tested for harmful substances. Both models are tested for traces of possible contaminants and potentially harmful substances to ensure that they achieve standards over and above the legal requirements. A professional test lab checks for residues of pesticides, heavy metals, dyes, plasticisers, formaldehyde and allergenic substances. All materials have been found to be completely safe for human health: not only the materials that come in direct contact with parents and children, e.g. seats, harnesses and grips, but also the dust caps and tyres. This regular testing enables us to ensure that your Croozer is a completely safe product that satisfies all current guidelines. More information can be found in our testing and compliance section.